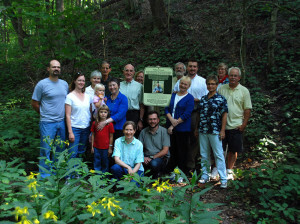 Scott and Ruth Sanders donated this 15-acre property in 2007 in memory of their friend and former Sycamore president, Dan Willard. A memorial sign is at the bottom of the hill near Mount Gilead Road. The preserve features mature oak woods and borders Morgan-Monroe State Forest. A tall ridge runs the length of the property, with its nose dropping off at the edge of Mount Gilead Road. The southwest corner of the preserve is a valley with an intermittent stream. Parking is limited to the shoulder of Mount Gilead Road. A deer trail leads partway up the steep hill behind the memorial sign. The rest of the hill can be climbed with caution. Following the top of the ridge east leads to a unit of Morgan-Monroe Forest, although there is no trail.